Get to know the stars of Condor Watch! California Condors (scientific name Gymnogyps californianus) are New World Vultures and became extinct in the wild in the mid-1980’s. Luckily very devoted conservation efforts led by the U.S. Fish and Wildlife service have brought this magnificent bird back from the brink of extinction and today over there are over 400 condors in the world – with about half of the population in the wild (or as we call them ‘free-flying’). Captive- bred condors are released into the wild from release sites in Arizona, California, and Baja California Mexico. As of Jan 31st 2014, there was a worldwide population of 410 California condors, with 232 of these birds “free-flying” associated with the following release site locations: 128 in California, 75 in Arizona and 29 in Baja California Mexico. Condor Watch currently only has photos from California, but we hope in the future to expand to photos from the Mexico and Arizona flocks as well! 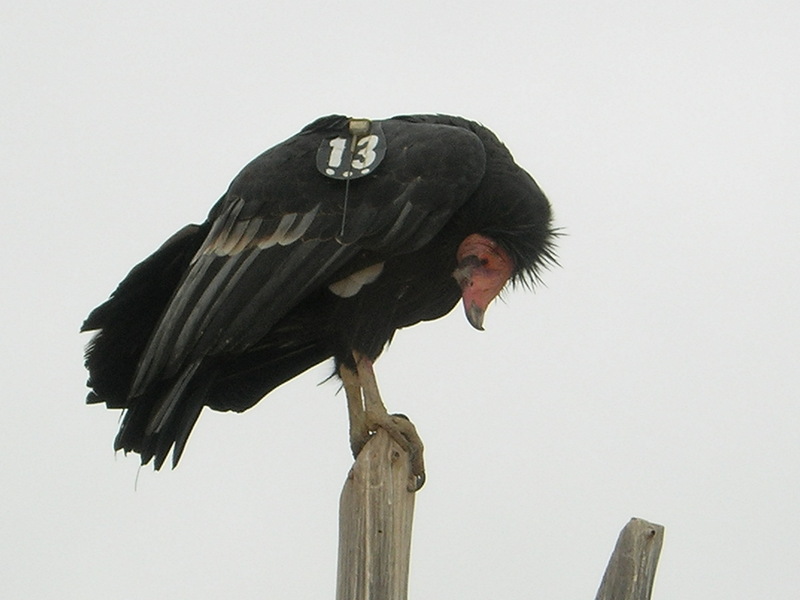 All free-flying condors are tagged with ID numbers (which is why we can give you a bio on each bird!) but they all should have (unless they lost it) also a radio transmitter and sometimes even a GPS transmitter so the condor biologists can track their movements on a near daily basis. Condors are long-lived animals, with a lifespan believed to be upwards of 60-70 years! They form long-term relationships, and typically will stay with the same mate for life. They can only raise one chick per year, and normally start breeding at 6 to 8 years of age (when they achieve their full adult plumage and coloring). Condors do not build a nest per say but will lay an egg in a cave, on a cliff, rock crevice or even a hollowed out part of a tree – which makes it interesting for the condor biologists to check on the egg! Both parents care for the chick until fledgling, which is ~7 months after the egg is laid. After fledgling the chick is still dependent on its parents for several more months and sometimes you might even see a parent with its chick in one of the photos!